A council election result in Hull has been overturned by the High Court after ballot papers were sent to the wrong addresses. Independent candidate John Considine challenged the Derringham ward result after losing by just seven votes. The court heard that an unknown number of voters received ballot papers for the Marfleet ward by mistake. Mr Justice Jack said the result "may well have been affected" by the mix-up and ordered a fresh ballot. UKIP candidate John Carnforth was declared to have won the seat in June after six recounts. He received 945 votes to Mr Considine's 938. But the court heard that in the days before the poll some electors in the Derringham ward received ballot packs which contained papers for the Marfleet ward, which is on the other side of the city. Mr Considine's counsel, Helen Mountfield, told the court that it could not be said how the people would have voted if they had received the correct papers. 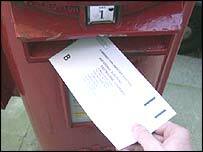 Hull City Council had urged voters to obtain replacement ballot papers once the mistake was realised. But Mr Justice Jack said the publicity was not enough to make the election result stand.